This weekend it’s the Annual Willie Stargell Celebrity Invitational at the Country Club of Landfall! Now in it’s 14th year, the golf tournament is held in honor of baseball great Willie Stargell who died of kidney disease in 2001. The event starts Friday night from 7:00 until 10:00, with a private VIP Celebrity and Sponsor reception. Then on Saturday night the Willie Stargell Auction Dinner and Dance, which is black tie optional, will take place at 6:00 in the Landfall Ballroom. The golf portion of the event happens Sunday morning at 9:00 after a light breakfast at 8:00 for the golfers. Celebrities at this year’s event are Olympians, actors, retired coaches, and retired athletes from the NFL, MLB, NBA, and college athletes. A few celebrity attendees include, Ron Robinson, Reggie Sanders, Cliff Levingston, Harvey Glance, Anne Donovan, Kirnari James, Dwight Hicks, Tony Womack, Dominic Santana, and Jerry Royster. The Willie Stargell Foundation’s mission is to provide funds to support kidney disease research and treatment for those suffering from the disease. Last year’s Celebrity Invitational raised $100,000 for the Foundation. A limited number of tickets are sold to the public for $100 per ticket. The ticket includes entry to the Gallery Public Tent, food, and beverages. For more on the Willie Stargell Foundation or to purchase a ticket visit their website http://www.williestargellfoundation.org. The 3rd Annual Flavor of North Carolina Fall Harvest Festival is taking place this Saturday at the Blockade Runner Resort. This event, which benefits the Good Shepherd Center in Wilmington, is a huge fundraising event. This year’s theme is fall harvest at the beach. Taking place from 7:00pm until 10:00pm, the event includes a harvest feast, beer, wine, a signature drink, music, dancing, and games. Additionally, guests will be able to win prizes by playing trivia and corn hole. The auction is a major event during the evening, with items donated by over 100 companies and organizations in North Carolina. Some of the auction contributors include The Dale Earnhardt Foundation, Hope From Helen, Island Passage, Carolina Hurricanes, 22 North Restaurant, NC Zoo, Silver Coast Winery, Raleigh Marriott City Center, and Port City Java. Tickets are $60 per person. Come out and enjoy this exciting fall event and help a great cause at the same time! This weekend it’s the 15th Annual Landfall Tradition Golf Tournament! The college women’s golf tournament is one of the best in the nation with 18 teams competing. The tournament starts Friday morning on the Dye Golf Course at the Country Club of Landfall. Golfers will start Friday and Saturday morning at 8:30 and Friday morning at 8:45. The events end Sunday evening with an awards ceremony. On Thursday before collegiate tournament there is a College-Am Tournament, which ends with a reception, Dinner of Champions, and an award ceremony. This College-Am Tournament has contributed over $300,000 to the UNCW golf scholarship program. Everyone is welcome to this fun event, and admittance and parking are free. The Landfall Tradition is a great opportunity to see the top college women golfers in the country compete and to come out and support your favorite team. 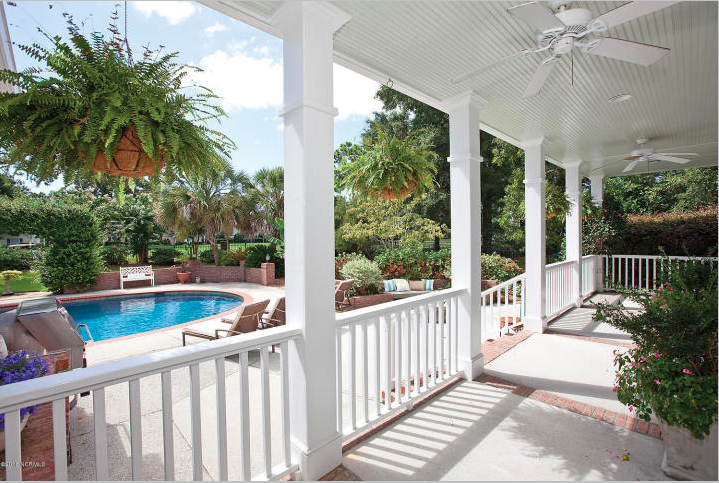 This lovely villa home is nestled in a beautiful section of the gated community of Landfall, with views of the Intracoastal Waterway and close to the Dye Clubhouse. This home has been meticulously maintained, and represents the best of coastal living with 3 bedrooms, 3 baths, a gourmet kitchen. The house has a cozy warm feel in the study and gracious living areas that include built in shelving and a gas fireplace. The private terrace out back is spacious and perfect for entertaining. For your convenience the landscaping is maintained by the HOA. This Saturday it’s the Annual Beach2Battleship Iron Distance Triathlon! The internationally recognized competition attracts athletes from all over the world to compete across Wilmington. 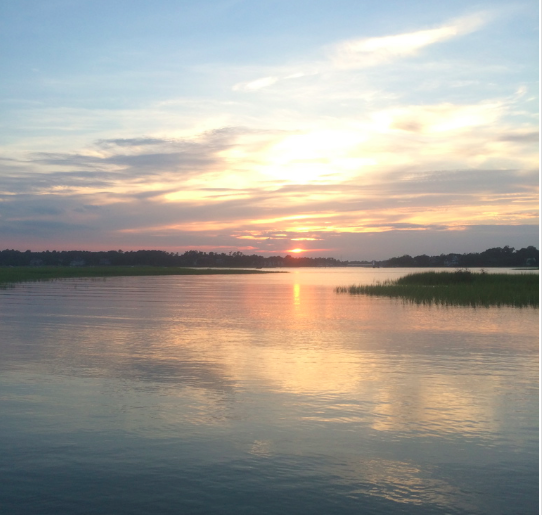 The race starts with a 2.4 mile (1.2 mile for the half) swim in Banks Channel in Wrightsville Beach at 7:15 am. 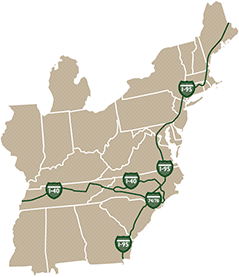 The swim is followed by a 112 mile (56 mile for the half) bike ride which starts at Wrightsville Beach and takes competitors through Wilmington and three surrounding counties towards White Lake, before ending in Historic Downtown Wilmington. From there the running portion begins with the athletes running 26.2 miles (13.1 miles for the half) around Downtown Wilmington and Greenfield Lake before finishing on the Cape Fear River right across from the USS North Carolina Battleship. This exciting race sponsored by PPD brings thousands of competitors to Wilmington every year. If you see the swimmers, bikers, and runners this Saturday be sure to cheer them on! While Hurricane Matthew left a trail of destruction along the East Coast, Wilmington and Landfall received very minimal damage. Landfall never lost power during the storm partially because Landfall’s utilities and power lines are underground, which is extremely beneficial since Landfall will often have power when other parts of Wilmington lose theirs. The damage around Landfall mainly consisted of broken tree limbs and minor debris, and was cleaned up in the common areas by Landfall Maintenance. A couple roads were flooded for a day, but Landfall Security made sure any roads that were impassable where blocked off. Both the Nicklaus and Dye Golf Courses are already open to the delight of golfers. Landfall and Wilmington were lucky to have escaped relatively unscathed from a storm that caused so much harm to the surrounding areas. Next Monday, October 17th, the Landfall Foundation is sponsoring a golf benefit open to all Country Club of Landfall Members. The tournament will be played on 18 holes of the Nicklaus Course with a 1:00pm shotgun start. There are three flights for three different levels of play, and you can register as a single or in a group. There will be awards for every flight based on one best net ball per hole. Following the golf portion there is a cocktail hour and awards dinner. The cost is $150 per player or $40 for only the evening cocktail hour and dinner. For more information on the Landfall Foundation Golf and Awards visit their website http://landfallfoundation.org/golf.html. This is a great opportunity to have fun and raise money for a great organization. 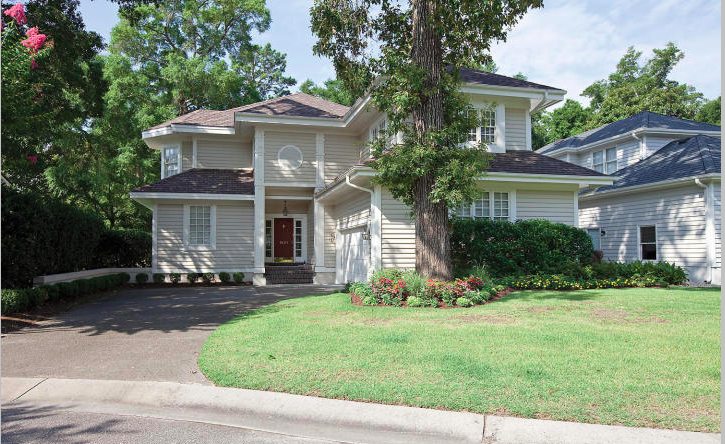 This charming home is located in the desirable first phase of Landfall. 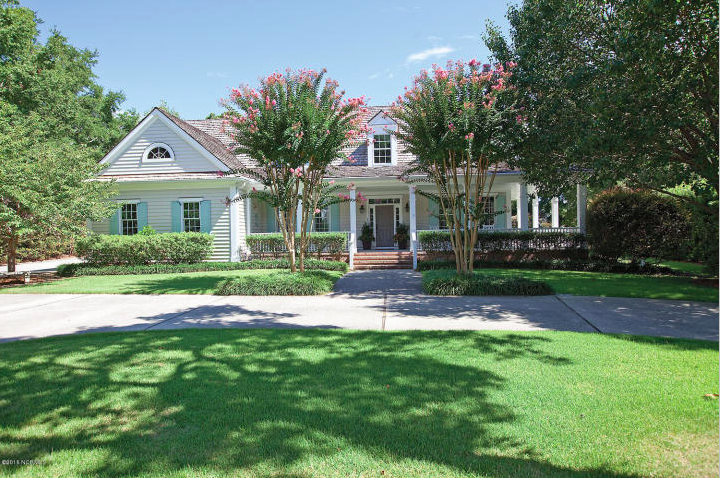 This beautiful 4 bedroom 4.5 bathroom custom built home overlooks the 12th hole of the Country Club of Landfall Dye course. Spanning over 4200 sq. ft., this magnificent home is filled with an abundance of natural light, looking over a large mature fenced yard with a tranquil saltwater pool/spa setting. The wrap around porch is amazing for enjoying coastal breezes, and the summer kitchen completes the outdoor living space. Many updates by the current owners include; refinished kitchen with a large center island, all new stainless steal appliances, marble counters and a bar. The open floorplan has a bright gathering room and eat in kitchen area. Hardwood floors throughout the first level including the large master tucked away from the other living spaces. You will also find an additional family room at the back of the house with pretty views of the pool and golf course, a home office and formal dining room. On the second floor you will find 3 bedrooms, a large playroom that could be a 5th bedroom, a loft that offers great flex space and 2 spacious walk in attic spaces. Other recent updates include freshly painted exterior and trim, new hot water heater, new pool filter system, fresh paint inside, and new carpeting throughout the second floor. October is a busy month for kids at the Country Club of Landfall with four after school activity classes, a movie night, and a Halloween Party! 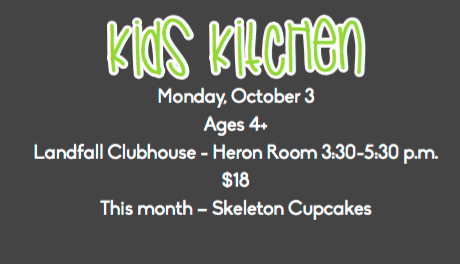 After school classes start with the Kids Kitchen on October 3rd which meets from 3:30-5:30 and this month is making skeleton cupcakes. The Lego Club is another popular class that meets every Wednesday this month at the Drop-in Kids Room at the Landfall Clubhouse. Due to the popularity of this class reservations are now required. Another after school class is the Craft Classes that are taking place on October 10th where kids will make screaming pretzels and the 17th they will be making vampire mouth cookies. A new after school class for the month of October is the Beast Busters University. Taking place at the Drop-in Kids Room at the Landfall Clubhouse this group meets every Thursday. Some beasts kids will be learning about are werewolves, zombies, vampires, ghost, and unicorns. In addition to the classes there is a kids dinner and movie night on October 7th from 6:00 until 9:30. 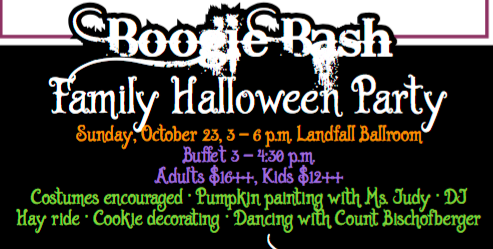 Later this month is the Family Halloween Party at the Landfall Ballroom on Sunday, October 23 from 3:00pm until 6:00pm. This Halloween party encourages costumes and includes pumpkin painting, a DJ, hay ride, cookie decorating, dancing, and dinner. You won’t want to miss out on these exciting Halloween activities this fall at the Country Club of Landfall!